Summer is fast approaching and the temperature is beginning to rise, which can only mean one thing; barbecue season is nearly here! What better way to spend a summer day than with friends and family in your outdoor entertaining space? Stacking sliding doors provide the perfect transition from indoors to outdoors and can help create the ultimate alfresco area. Characterised by the ability for their panels to roll and ‘stack’ behind one another, they are as stylish as they are functional, creating a large open space with an opening 2/3 larger than regular sliding doors. 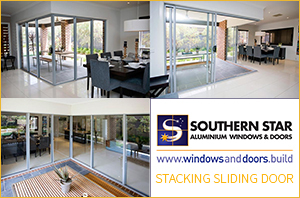 Southern Star Aluminium Stacking Sliding Doors are available in each of our three Series of products. The 100 Series Stacking Sliding door provides an entry-level option, delivering the quality and style synonymous with the brand for the budget conscious. The 200 Series Stacking Sliding Door combines sophisticated and modern architectural design with superior quality, functionality, style and value. It can be double-glazed and is suitable for most semi commercial projects. The 300 Series Stacking Sliding Door offers a generous 111mm frame and is an attractive door, yet solid with a heavy-duty frame. The 300 Series Stacking Sliding Door can also be glazed up to 18mm. Stacking sliding doors are also available in Timber. Keep an eye out for more information about Timber Stacking Sliding Doors in the coming weeks, or visit our website now for more information. Make your summer special with a Southern Star Aluminium Stacking Sliding Door.